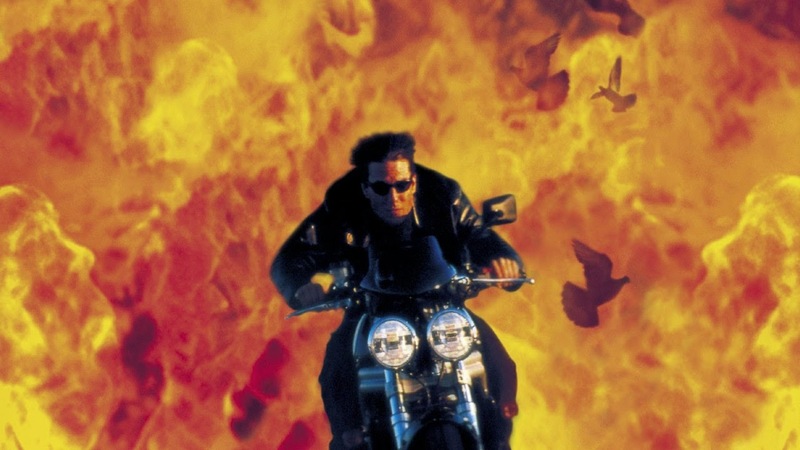 Lexengine: Mission: Impossible - II (2000): stunts are thrilling but plot is dubious. 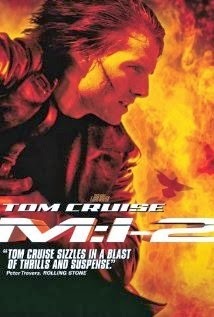 Mission: Impossible - II (2000): stunts are thrilling but plot is dubious. My review about this movie was long planned by me. But I went through several websites to look into some details of this movie. I found that some scenes of this movie (one being scene, in which Naya meets Ethan at the race course) were copy of some earlier hollywood movies. Now, you might be thinking that not only Indians copy. I also agree. Apart from it, there is a glitch of overuse of mask in this movie. Even at the climax, you will be bound to ask "how did Hunt get the mask of Stamp". But, all I can say is that the stunts shown in this movie. The rock climbing scene in the starting of the movie was performed by Tom Cruise, without any stunt double. Another stunt during the injection gun scene and other in the climax are also thrilling. Even one of the scene has been copied in Dhoom: 2. Also I love the scene, in which Hunt blast the door, using a satchel charge and makes entry to disturb the deal (which is marked by a bird flying into the room and flares appear in the eyes of Ambrose). Also the music given by Hans Zimmer has made me a fan of him. The tracks like Bare Island, Mano-a-mano, Injection Gun define the art of Zimmer. Apart from this, how can we forget the song Take a Look Around by Limp Bizkit? This song has used the M:I theme track very beautifully and in an interesting way. John Woo's final cut of the film clocked in at 3-1/2 hours. The studio balked at this length and told him that the final length could not exceed 120 min. This could explain why there are so many plot holes and continuity errors in the theatrical cut. For the "knife-in-the-eye" scene, Tom Cruise insisted that a real knife be used, and that it stop exactly one quarter-inch from his eyeball, instead of somewhere vaguely near his eye, as John Woo suggested. The knife itself was connected to a cable that was measured carefully in order to achieve the effect and Cruise insisted that Dougray Scott use all his strength in the ensuing struggle. The famous rock climbing sequence was filmed at Dead Horse Point in Utah. Tom Cruise was on cables which were then digitally removed. Ron Kauk was the climbing double and the overhang stunt was performed by main stunt double, Keith Campbell. John Woo was so scared each time but "Tom insisted on doing it". The scene where Tom Cruise "peels off his face" to reveal Dougray Scott was achieved in one shot by shooting both actors against a green screen. Cruise, not wearing a mask, was simply told to place his hand in a pre-arranged position under his chin then pull his hand across his face. Scott wore a plain mask with sensors that could provide a computer with a three-dimensional view of his face. He then peeled off this mask to finish the scene. Cruise's face was superimposed on the mask as it is pulled away and the two images morphed together in the computer; the background of the 747 cabin was added in to replace the green screen. (Watch the scene with frame advance and you will see a slight transitional 'swirl' on the mask halfway through the scene). Kevin Yagher contributed some more traditional latex mask effects for other face-peeling scenes. This is the first movie that Metallica ever agreed to write a song for. Dougray Scott was originally slated to play Wolverine in X-Men (2000), but had to pull out when shooting on this film went into overtime. The part of Mission Commander Swanbeck was originally offered to Ian McKellen. He was not able to accept the role, due to a prior theatre engagement in London and the part eventually went to Anthony Hopkins. Luther Stickell's line "It's that simple, huh?" after hearing Ethan Hunt's explanation of what he thinks "Chimera" is was a joke about Mission: Impossible (1996), which was widely criticized for having an overly complicated plot. Tom Cruise's then-wife Nicole Kidman suggested Thandie Newton (Kidman's co-star in Flirting (1991)) as the love interest for Ethan Hunt. She was cast before the script was written. SERIES TRADEMARK: At Hunt's meeting with Mission Commander Swanbeck, Hopkins offers him an espresso or cappuccino. At the preliminary meeting with Jim Phelps in Mission: Impossible (1996), Hunt asked if they could get a cappuccino machine. The sunglasses that Tom Cruise wears at the climax of the climbing scene providing him with his mission brief are modified Oakley Romeos that are now discontinued. They were modified for their appearance in the film in three ways: the ear stems are different (the commercially available model had curved ear stems while the movie version has straight stems), the lenses used in the film aren't mirrored (to prevent the film crew being seen in the reflection) and the most obvious modification being the earpieces grafted on to the frames. According to Robert Towne, much of his script was written around action scenes that director John Woo told him he wanted to able to direct in the movie. Anthony Hopkins' character becomes the first person in any Mission Impossible episode or movie to actually use the phrase "mission: impossible." Ronald D. Moore and Brannon Braga also wrote the screenplay for Star Trek: First Contact (1996) which featured the first cinematic use in dialogue of the phrase "star trek." Andrew Lesnie was the film's original cinematographer. He left less than a month into shooting, due to "stylistic differences" with director John Woo. The movie initially was rated "R", but was re rated "PG-13" after many action scenes were cut and the violence was trimmed down considerably. Oliver Stone was the first director attached to this film in the period after the first film's release. He reportedly wrote a treatment but backed out due to scheduling conflicts resulting from Tom Cruise's prolonged stint on Eyes Wide Shut (1999). SERIES TRADEMARK: Ethan is suspended by a cable while infiltrating the Biocyte Labs. See also Mission: Impossible (1996) and Mission: Impossible III (2006). Steve Zahn was originally cast as Billy Baird. Production was delayed because Tom Cruise was shooting Eyes Wide Shut (1999) with Stanley Kubrick for over a year. Both Tom Cruise and John Woo attended a test screening of this movie in Warrenville, IL. Stuart Baird did uncredited re-editing work on this film and Lara Croft: Tomb Raider (2001) for Paramount in order to get the job of directing Star Trek: Nemesis (2002). Triumph Motorcycles supplied the Speed Triple and Daytona models used as Tom Cruise and Dougray Scott's rides respectively. A brief shot of children playing "Ring Around the Roses" is shown. This is a subtle reference to the plague that would ensue should the Chimera virus be released onto the world. According to popular belief, "Ring Around the Roses" was a kids' song based on the medieval Black Plague. In this theory, the "ring around the roses" represented a ring of people around a grave with roses on it. "Pocket full of posies" refers to people carrying flowers in their pockets during the plague, to combat the stench of the corpses in the streets. "Ashes, ashes" refers to the mass burnings of bodies. "We all fall down" refers to the multitudes of people dying. In fact, the rhyme dates from Victorian times, and originally did not contain these specific references, which were created in improvisational children's playing. Nevertheless, the legend connecting the song with the plague persists. In the final battle, the building's security systems shows a problem in Level 42, the name of a 1980s band with hits that include "Lessons in Love" and "Something About You". Shipped to theaters under the fictitious name "Doll House" to deter potential thieves.